Molybdenum production methods include production method of molybdenum powder and molybdenum products. Molybdenum powder common production methods are reduction method, hydroxyl thermal decomposition method and molybdenum chloride pyrolysis method and so on. Molybdenum chloride pyrolysis method preparation technology is simple and can produce high purity molybdenum powder with small particle size. However, it has high requirements on raw materials and t exhaust emissions and other issues in the preparation process should deal with. Hydrogen reduction method which is the most widely used, its production cost is low and easy to carry out industrial production. 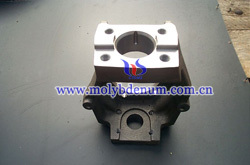 Besides, the molybdenum powder has high purity and the particle size is generally in the micron level. Hydroxyl thermal decomposition method usually uses hydroxy molybdenum as raw material, at atmospheric pressure and temperature 350 ~ 1000 ℃, in N2 atmosphere through steam thermal decomposition on hydroxy molybdenum to produce molybdenum powder, in the meteorological conditions nucleation, crystal and crystal nucleus grow up, so the powder is finer and has higher chemical purity and good sintering. Besides, this method can be used in industrial mass production. Molybdenum products production methods have arc melting - casting method and powder metallurgy, mainly powder metallurgy. Its production process is roughly as follows: Mixing - forming - sintering - overhanging forging - machining. In addition, the molybdenum alloy can also use arc melting - casting method for production, which use electric arc to melt pure molybdenum and to add a certain percentage by weight of alloying elements, and then to use conventional casting method to get molybdenum alloy.